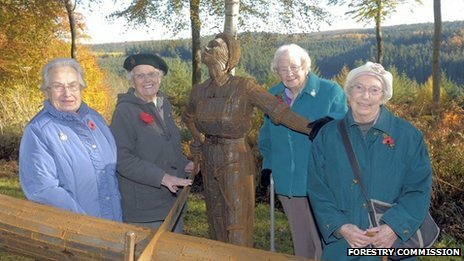 A memorial to the "lumberjills" - the women who worked in forestry during World War Two - has been unveiled in North Yorkshire. The sculpture in Dalby Forest, near Pickering, is a steel fabrication of a felled tree and two lumberjills. Some 9,000 British women were recruited to work in forestry during the war. 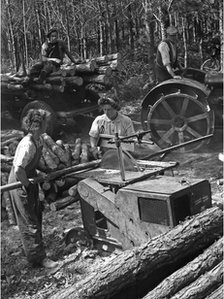 The lumberjills carried out heavy work, felling trees by hand, working in sawmills, loading trucks and driving tractors. The timber was made into telegraph poles, road blocks, packaging boxes and gun butts for the war effort, and even crosses for war graves. 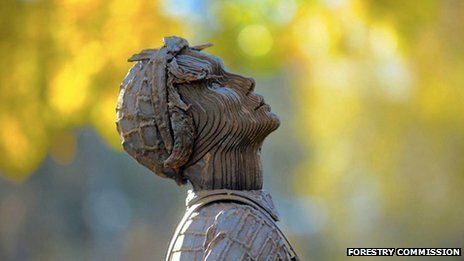 Sculptor Ray Lonsdale won the Forestry Commission competition to create a lasting memorial to honour the women. The sculpture on Haygate Bank in Dalby, called Pull Don't Push, is five metres long and three metres high. 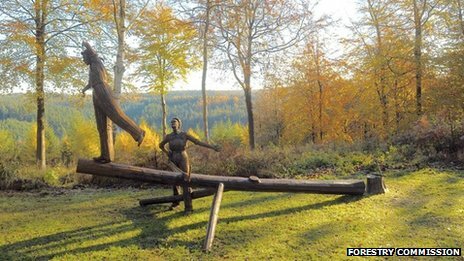 The Forestry Commission said the sculpture "captures the arduous nature of the work as well as the fun [lumberjills had] working in the forests during the war." The Women's Timber Service was set up during World War One, becoming the Women's Timber Corps (part of the Women's Land Army) in 1942. The lumberjills wore a green beret to distinguish their unit. Edna Holland (nee Lloyd), 88, from Beverley trained as a lumberjill in Wetherby and worked across the North York Moors throughout the war. "Physically it was very, very hard work," Mrs Holland said. "We started off by learning to fell a tree. We used the axe to put the wedge in low to the ground to know which way it was falling. "We then used a cross-cut saw to fell the tree and chopped the branches off the tree with the axe." The Forestry Commission said 60% of timber needed in World War Two was grown in Great Britain and 46% of trees were felled. By 1945, usable standing timber had been exhausted.